I’m excited to announce a new partner for CollectPeanuts.com. Zooz Pets is bringing Peanuts fans a wide variety of pet products featuring the Peanuts gang. They’re just getting started and have Snoopy dog shirts, hoodies and sling bags for your pooches. Made for dogs of all sizes, the Zooz pets shirts and hoodies come in a variety of designs, featuring bold prints of Snoopy and Charlie Brown. If you share your life with a small dog, bring him along in a Snoopy sling bag. The sling bag zips up, plus has a pocket for your cell phone and a collar attachment hook. 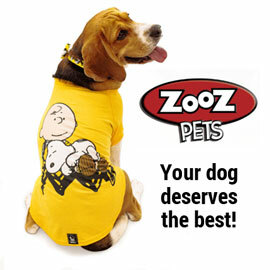 Share your love of Peanuts with your dog and Zooz Pets Snoopy shirts and slings. Your purchase through our links helps CollectPeanuts.com to bring you great content. Thank you! Watch this space! I’ll let you know when the Peanuts harnesses, dog bowls, dog beds and more are available! Plus, check out my article on the Zooz Pets Snoopy dog shirts.